Solarflo Infra-Red Heaters work like the sun, radiating energy that directly warms you and objects around you, not the air. You then act as a secondary heater, transferring heat into the air. This makes the working level extremely comfortable, unlike forced warm air systems that waste heat at the ceiling level. A forced warm air system heats the air at the ceiling level first, leaving the working level cold and uncomfortable. You pay for heat not being used or felt by your employees. Looking for Infra-Red Heater Specifications? Best Warranty Available – 2 years on entire heater, 15 years on ceramic emitter. Reduces Heating Costs by heating working level first. Flexible 0-35° mounting angle, modular design, and multi-zone thermostat controls enable quick, clean, quiet, economical, comfortable heating. Heat Where You Want When You Need It – Don’t waste heat on storage spaces. Heat total building or specific areas. Low Maintenance Costs – No moving parts to wear out or replace. All Stainless Steel – The burner housing, frame, upper shield, and reflector won’t rust, oxidize, corrode, or dull with age. Stainless steel stays brighter, lasts longer, and retains its new appearance and performance. 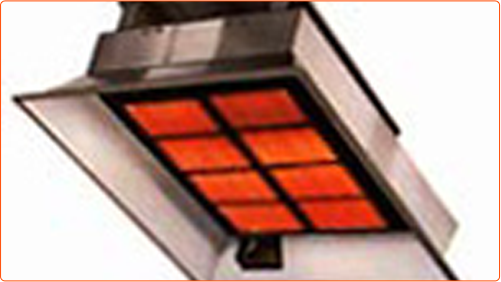 Outlasts and Outperforms aluminum/steel heaters. No grills, rods, or screens needed to boost radiant emissivity.